Harry Slatkin is a name I’ve come to associate with affordable home fragrance options that make my home smell delightful. I know when I walk into Bath & Body Works, the money I hand over for the products with his name on it won’t let me down. Apparently I’m not alone in recognizing his special gift. The past Thursday, the American Society of Perfumers honored Mr. Slatkin with the coveted Living Legend Award. This prestigious award honors a person “who has distinguished him or herself over the years with their body of creative work, their contribution to the fragrance industry and also their contribution to society.” Past honorees include Oscar de la Renta, Gianni Versace, Oleg Cassini, Karyn Khoury and Estee Lauder. That last part however, “their contribution to society” is another side of Mr. Slatkin I recently came to know as I was invited to join him, his wife Laura and his son and daughter as they rang the closing bell of the NASDAQ in honor of Autism month. Mr. Slatkin’s son, David, suffers from Autism. Shortly after David was diagnosed, The Slatkin’s joined forces with Suzanne and Bob Wright as founding board members of Autism Speaks. Additionally, they have focused their efforts locally by founding the first public charter school dedicated to serving children with autism which opened in 2005, the New York Center for Autism (NYCA) Charter School. In the fall of 2008, NYCA opened the doors of the Autism Training Institute at Hunter College, a collaboration that aims to increase the number of qualified educators available to work in the New York City Public Schools. That is quite a contribution to this growing epidemic that is diagnosed in one in 150 children in the United States, affecting four times as many boys as girls. It has to do with what my parents wore when I was a child. My mother used Joy and Norell – Joy for special evenings and Norell for every day. Those fragrances are so unique to that moment in time that every so often when I’m in crowded elevator and I get a whiff of them I want to ask who is wearing Joy or Norell but I fear they might think I am a pervert! My father used Canoe and eau Sauvage. He died when I was 13 and I continued wearing it until my dear perfumer friend Christophe Laudemiel created a scent for me. And like the way I am with my familiar parental scents, my 9-year-old daughter loves to go into my closet when I am traveling and smell my suits. It’s like a big hug! Since you initially went the finance route, working for Bear Stearns, how did your love for fragrance play itself out up until you decided to make the switch? Did you collect cologne, candles, etc? When I was very young I was in charge of setting up all the home fragrances for my mother. She used Rigaud candles and floris lamp rings – I remember the rings the most as I would put several drops of oils on the rings and the heat from the lamps would make the scent rise. We varied the scents and my mother let me decide what scents to use throughout the house. It’s funny that I now have a home fragrance oil business today because we are the #1 dominant player in that area. As the years passed I used home fragrance and tried many different scents from shopping and my travels – I tend to change my personal scent less than my home scents – I like decoration and to me scent is about decorating your home. Do you remember what you were doing when you had the epiphany that you were going to make a career shift to the fragrance industry? Well, it first started out with a friend on Wall Street asking me to meet his fiancé, Vera Wang. At the end of our dinner she said Wall Street is great for her fiancé, but for me, I had too much creativity. She was right. That led me to do some soul searching, as I was a director at Bear Stearns and I was leaving to start my own business from nothing – but the biggest rewards are the biggest chances you take. Home fragrance was an accident that my wife and I were dabbling in when Rose Marie Bravo came to see us and launched us in Saks not on the home floor but in a large shop in Couture. 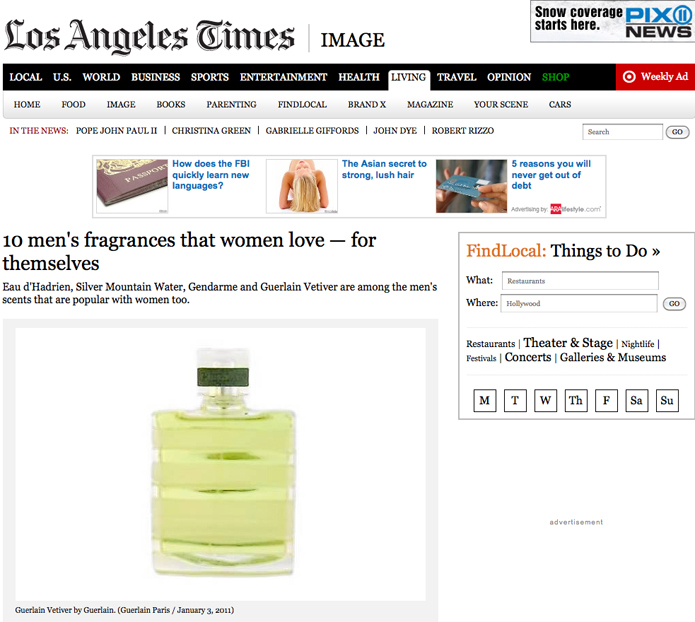 Then WWD wrote a big article on us and then Ralph Lauren, Martha Stewart and Banana Republic all came to me to do their home fragrances and the rest is now home history! Are there any scent families that are dearest to your heart? I am asked this often and I have mood changes but I always seem to go back to the Orientals. I love that mood year round but I will always layer it depending on the season. This time of year I’ll mix it with fruits or something clean or fresh for summer, floral for fall and then holiday scents. I like to change often and I have about 14 different scents in my New York home mixing at all times. Do you have a personal signature candle scent? If so, what is it? I have two scents that I think have become iconic to Slatkin & Co – my bamboo and Jasmine and my holiday scents. No matter how many we make of either of these products, they sell out quickly and have for years. If they aren’t in stock, I get tough emails and letters demanding them! Are there any plans for a Harry Slatkin personal fragrance collection? Not yet, although, the success we’ve experienced on QVC has made people ask for other products. So it could happen in the future. With all the success you’ve achieved, what does the Living Legend Award from the American Society of Perfumers mean? As I was sitting and listening to my dear friend Linda Wells’s and all the kind words she had to say about me, it was her remarks about the difference I have made in the industry and that the name Slatkin will go down in history for home fragrance that made me very proud. I have made a mark and I did change the industry into a behemoth. People will never live without home scent and I am glad that I have made so many people happy who use my products. And thank God it’s a Living Legend award and not something in memoriam! It’s funny but I have two distinct favorite memorable scents. Every time I kiss or hug my son and daughter I smell them. They have a unique scent that I would never share with anyone. That is my most precious olfactive enjoyment and wherever I am in the world I can smell them and it makes me smile. Some scents are not meant to share.